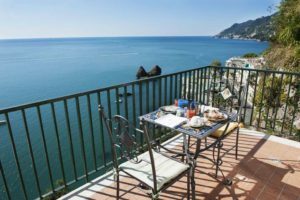 Are You looking for Amalfi Coast Italy hotels? Come in Vietri sul Mare, the first of the Amalfi Coast towns. This town is known for the pottery You can admire all over the streets. As many centers of the coast, Vietri territory is divided into a high cliff where to appreciate the panorama, and the marina few steps far from the beach. Let me guess: You are looking for comfort. Well…for the experience that we have in hosting and for our position, we can offer you the top of comfort. As we already told You, we are very close to the center. Moreover we have free private car park which is an unimaginable thing in the Amalfi Coast. In fact, town parking is something like 5€ per hour. In all the prices of rooms are included breakfast, minibar, air conditioning, heat, free WI-FI, TV…but, have a more detailed look here! Did You know that we are able to plan weddings and events in Bristol Hotel? Have a look to our services! Are You looking for the perfect Amalfi Coast Italy wedding? Many couples every year come and get married in the Amalfi Coast. Do You want to plan a meeting in our hotel? It really looks like the perfect place for events. Our hotel has a long experience in hosting, and making plans come true is one of our goals. This day will stay in the memory of the guests forever, so it must be an excellent wedding or meeting reception. We are able to give two kind of locations, excellent and exclusive catering service, traditional and special menus and the wedding cake. We thank You so much for visiting us. We wait for you here in Bristol Hotel for your holidays and events!